Our August Wellness Workshop is here with Melissa French! Want your movement to feel as effortless as meditation? Moving through life is simply a series of folding and unfolding, twisting and untwisting. Are you doing it with effort or ease? Had a yoga or workout injury? Been injured from daily activities (or sitting)? Felt like certain parts of your body are frozen, stiff, or dormant? Felt like you’re not moving optimally? When we move well, we live well. Movement should be easy and joyful. If you’re moving in ways that add stress to your body, it’s simply not serving you in the long run. 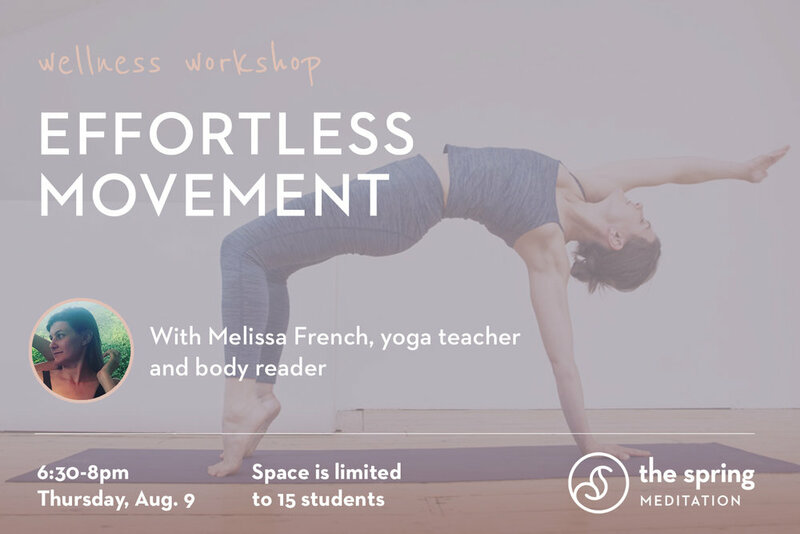 Yoga teacher, body reader, and movement expert Melissa French will help you take the stress out of movement. Whether you practice yoga or not, you’ll learn how to get full benefit from your movement throughout the day. Melissa assesses imbalances by reading the feet, which inform our movement patterns and connect to all our body systems. She’ll share an introduction to body reading during the workshop, and one lucky participant will experience a foot reading! We hope you'll join us and bring a friend or two!